Colombo Cricket Holidays & Tours. Getting to know a city can often feel like solving a mystery. Which areas are home to the best shops, the hottest nightlife or the tastiest restaurants? Sri Lanka’s capital is jam packed with contrasts and colour, from elegant mansions and tropical gardens to chaotic streets teeming with the traffic. But you don’t need to worry about finding things to do in Colombo, we’ve done the detective work for you. From afternoon tea in a four-star hotel overlooking the mighty Indian Ocean to thrilling tuktuk rides, Colombo is a feast for the senses. This city was founded on land once crowded with cinnamon groves but is now dotted with high-rise blocks and skyscrapers. The port which attracted Portuguese traders still bustles and the streets teem with life. Here are a few clues to find Colombo’s most popular temples, trading places and temptations. Pettah is famous for being one of Colombo’s liveliest districts. At its centre, the vibrant red, richly-decorated minarets of the Jami Ul-Alfar Mosque have always been a colourful Colombo landmark. Before skyscrapers crowded the skyline, sailors used the mosque’s towers as their guides to a safe port. 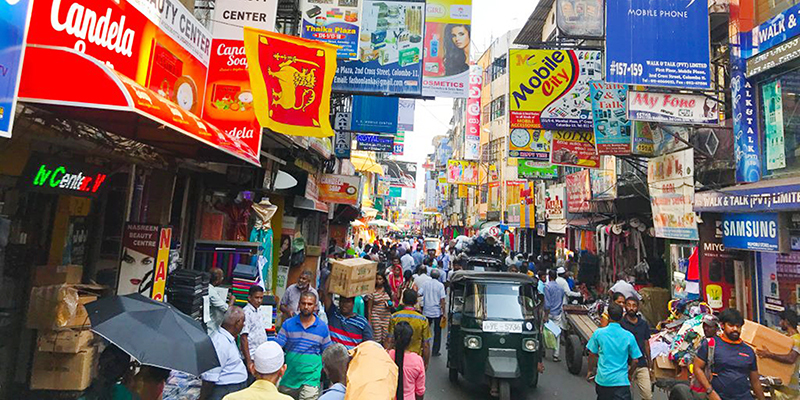 Close by you’ll find Pettah Market, a true assault on the senses heaving with fragrant spices and local crafts. Love it or loathe it, the bazaar is unmissable. Dehiwala is a fantastic fusion of flora and fauna. Set in 30 acres of landscaped gardens, the zoo hosts a collection of 3,000 animals with an emphasis on conservation, welfare and education. As well as encountering rare and endangered species you can enjoy performances by elephants and sea lions. Floral highlights include patches of woodland and shady nooks with a delightful butterfly garden entwined with creepers and bubbling with streams. The bright lights of Colombo city centre have taken on an extra lustre in recent years. A plethora of nightclubs and bars have sprung up to cater for tourists and a burgeoning middle class. So you can start your typical Colombo night out with a Kothu Rotti, the quintessential Sri Lankan snack. Then why not swing by the aptly-themed Cricket Club in Queens Road before taking a spin round the dance floor at Kama Colombo. The glittering Gangarama Vihara rests proudly on stilts on the edge of Beira Lake. It’s hard to believe that where this pristine palace sits now 120 years ago bubbled a swamp. Colombo’s most famous sanctuary combines elements of many Asian traditions and is venerated by Sri Lanka’s Buddhists. A place of worship and a monastic school, the temple is festooned with giant statutes and colourful flourishes and is accompanied by a museum full of eclectic artefacts. The beachfront at Mount Lavinia is a popular meeting place for locals, with families flocking to its golden sands at the weekends. As the sun sets they head for a string of seafood restaurants with appetising views. Legend has it that the area takes its name from Lovinia, a gypsy dancing girl once secretly romanced by a local Governor. Now the Indian Ocean dances on the shoreline in her honour.